Recently, with the introduction of virtual Person Assistant such as Apple’s Siri, Microsoft’s Cortona & Amazon’s Alexa, AI & machine learning is all the rage. 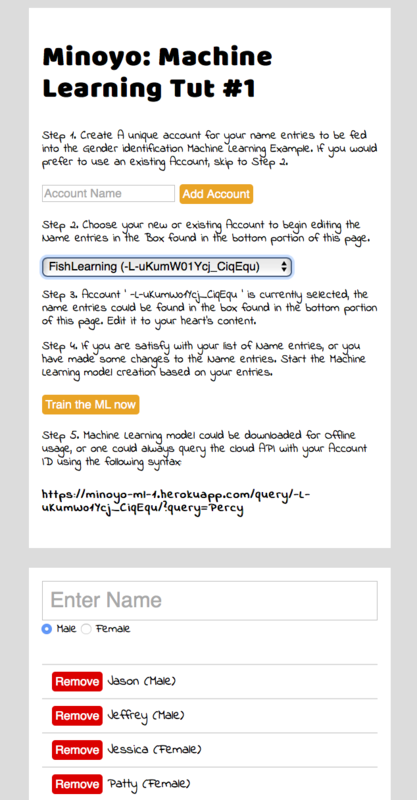 Part 1, Where we would create a simple Python script utilizing Sci-Kit Learn to generate a machine learning model & subsequently using the Model to perform some prediction. Part 3, With the engine which we have proven from Part 1. We will need to host it as a Web API. We will be looking at using Python’s Flask to create a web assessable API in which the user could i) Start training with the training dataset from our Firebase ii) Check on the status for the training models by Session ids iii) And of course a query API to exercise our engine with the models which was created. In the end we will have a full application consisting of a Vue.js based training set entry editor for data stored on Google’s Firebase and a web api for querying which is hosted on Heroku. I have hosted a working end result here. The first step to about anything in data science is loading in your data. This is also the starting point of this tutorial. The dataset could be found here. With the training set on one side and gender result on the other, we try to do fitting on the Test Set. Hoping that the computer will be able to find some pattern which correlates the gender of the person with the subsets of their Name. This is all done through the Magic of a Pipeline which ultimately Vectorizer transformer & utilize the Decision-Tree classifier on the vectorized sets. (Seems to work pretty brilliantly). Once it is done, we save the training model as myPipeline.pkl. This would allow us to reuse the model to do many future prediction of the gender from a first Name. To install the dependencies, I normally go the no-brainer path of using the pip tools to download and set up the requirements. Its function is about similar typical install tool, such as the Debian Aptitute apt tool or Node’s npm tool. Now that we have all the library requirements fulfilled, we could run the script, which would generate a trained model myPipeline.pkl to be used at a later date (subsequent script). Since we are using a rather comprehensive set of data, the process is going to take a bit of time. Once the trained model has been created, we could utilize it do make prediction of the name’s Gender. ( You may change the test set, which could be seen close to the bottom of the Prediction source code.